i was excited to hear that raia's opened and disappointed that i couldn't check them out right away. but me and a few other chowhounds finally made it there for lunch last week. 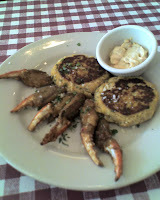 the crabcakes and crabclaws were fantastic in their cajun seasoning. the remoulade was delicious as well. it was a good start to a meal. my side caesar and a lentil soup hit the table next. both were just decent enough. 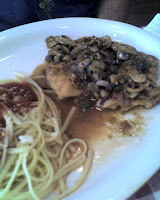 chicken marsala had a little too much wine in it for my taste, but still better than many versions of it in houston. 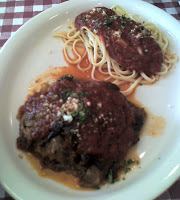 eggplant parmesan was delicious. the eggplant wasn't sliced thin, battered, fried, topped with a slice of mozzarella and marinara like most. our dish looked more like a casserole and the eggplant was mushy. there was a little mozzerella cheese hidden in the cocoction that was topped with marinara and then sprinkled with a little more mozzarella on top. the flavors were great, but if you don't like mushy food, you might want to steer clear. the pescatore which was the dish i was looking forward to trying the most (see my post on raia's opening) was the worst dish on the table. the dish was extremely fishy tasting and smelling. the pasta wasn't anything special. we determined that it was the calamari giving off the strong odor. three people split all of the menu items above (1 app, 1 pasta, 2 entrees), a large and small pellegrino and our bill was $60. a little steep for a lunch w/o table service i'd say. 2 other chowhounds got lunch specials - basically you pick an entree from the steam table, a salad (caesar or house), and dessert or a veggie. one person picked seafood lasagne which was okay. the other picked the fish special of the day, snapper grandezza, which i didn't try. she made no comment about it so i assume it was just okay as well. both of them also chose caesar salad and tiramisu. 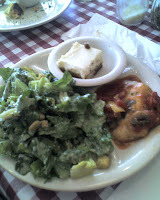 the lunch specials at $6.50 aren't a bad deal even though half the plate is filled with salad. after some digging and investigative questions, i found out that luke raia, the owner of the place, is part of the houston italiano crew made up of the mandolas, carrabbas, buteras, and petronellas. i am told they were all cousins and grew up together. 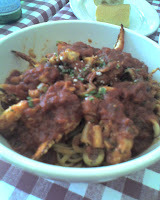 the family has louisiana roots which is responsible for tony mandola's seafood kitchen. luke mandola also owns the ragin cajun. now that i know it's legit, the crabcakes may be an indication of how good the other cajun items are on this menu.